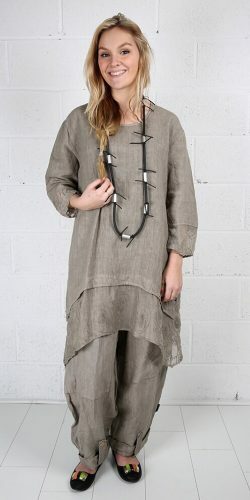 This is a longer length loose linen dress perfect for those long sunny carefree days. If you like a slightly quirky lagenlook style – this is defintely for you! The sleeveless dress features a simple scoop neck and simple bodice decorated by a central ( non functional) Zip. With a high waist the skirt is a full quirky style with 2 side front pockets also decorated with zips. Easy fit , making it the perfect foil for any unwanted lumps or bumps! 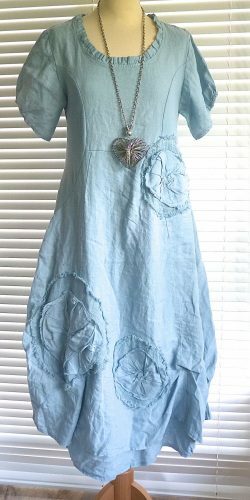 If you are an apple or pear shape, this is a perfect dress for you!